I am beyond excited that we have finally made it to October, my favorite month of the year!!! October just so happens to be my birthday month, but beyond that reasoning, I love October because its the actual start of Fall here in the South! I say that loosely as it is sometimes still in the upper 80's at Halloween, but typically it begins to cool off around mid October, and I am more than ready for cooler temperatures and all that it involves!! This week's SUNDAY SEVEN features some of my favorite recipes, clothing, and events for Fall! Y'all I'm obsessed with this adorable dress I just bought Stella and this whole store in general! They have the most adorable outfits for toddler to little girls! I can't even handle it! I bought this dress for Stella to wear this December when mom and I take her to the Nutcracker Ballet for the first time!! It is going to be so precious!! I can't wait!! My sweet neighbor always buys Stella's birthday gifts from The Learning Express Dallas store in Snider Plaza, so I started following them on social media. This coming Saturday, they will have Peppa Pig in store to meet the kiddos! Stella is obsessed with Peppa Pig, so we will definitely be going! Dallas friends, it is from 10-12pm in Snider Plaza!!! A perfect morning trip for your Peppa lovers! Yesterday, we woke up and I just felt like baking, so Stella and I went to the grocery store and came home and made our first apple pie together! It was a mess like you wouldn't believe, but we had so much fun, and even better, the pie turned out amazing! It was so yummy!! We used a recipe I found a few years ago on Pinterest when I was looking for a quick, easy apple pie recipe to try! It is so easy and delicious! If you're looking for a quick go-to this Fall, try this one out! I chose to buy pie crust rather than make it myself, but other than that I followed it to a T.
Did anyone else watch last week? OMG! I'm always a bit skeptical when they have a reboot of any show I loved, for fear that it won't live up to the past episodes! I am so happy that Will & Grace's return was nothing less than fabulous. It literally felt as though the show never ended. They were able to pick it up with such ease. The characters were still as lovable and charming and there wasn't any corny references or forced past series references! It was so refreshing and gave me all sorts of good feels! I am so excited about this new season!!! It airs on Thursdays on NBC at 9/8c!!!! At my school, we have the best cafeteria manager ever. 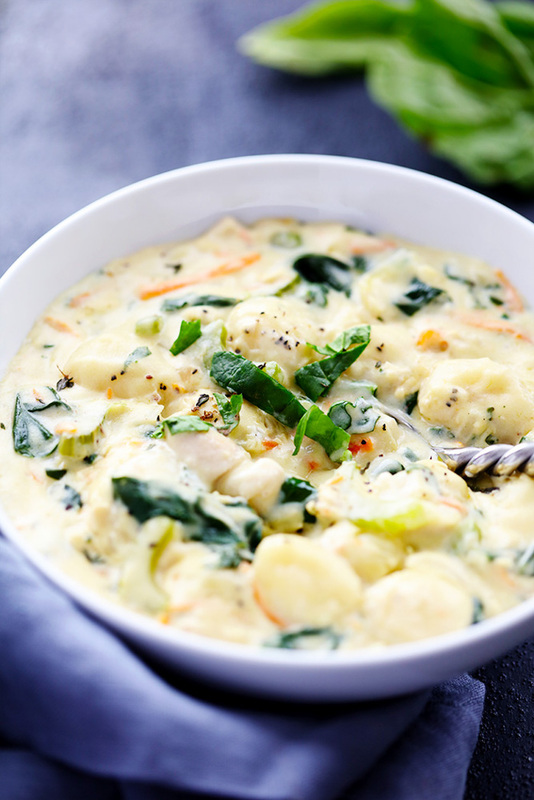 She makes some of the most amazing recipes, one of which is a creamy chicken gnocchi soup! Turns out, it is a copycat of an Olive Garden recipe! We rarely eat out so when we do we avoid chains, which means I have never tried Olive Garden's, but I can sure tell you that this recipe turns out just as delicious as Ms. Brenda's and that is a fete! I tried it today for lunch after church and both Matt and Stella loved it! To me it tastes similar to chicken and dumplings, but is made with potato gnocchi and spinach! So yummy and perfect for Fall!! Do you want a hand soap that makes you want to sit and smell your hands all day in a non awkward way? Then you have to buy Bath and Body Works' Pumpkin Cupcake gentle foaming hand soap! It literally smells so good that Stella asks to wash her hands at least ten times an afternoon just so that she can smell the soap! Seriously, its that yummy! Random I know, but if you're looking for a new Fall soap, this one is a winner! If you're looking for a new read for your toddler, definitely check them out!!!! Here's to another wonderful week! !